Last week, PricewaterhouseCoopers released its latest sports-market outlook, “At the Gate and Beyond,” providing revenue projections over five years (2016-21) within four key segments in North America: media rights, gate revenues, sponsorship, and merchandising. The report projects the sports market to grow at a compound annual rate of 3.1% across the four segments, from $69.3 billion in 2017 to $78.5 billion in 2021. Among the most notable insights in the annual report was PwC’s projection that, in 2018, sports media-rights deals will exceed gate receipts for the first time, with the majority of the growth over the next four years fueled by regional-sports-network deals. Media Rights Are Fastest-Growing Segment: Media rights are currently the fastest growing segment of the four with a CAGR of 4.3% over the Outlook period and will surpass gate revenues next year to become the largest. The monetization of rights available in the nearer term (25 RSN deals across MLB, NBA, and NHL will run off within the next five years, as well as in at least the beginning of the next national-rights deal cycle) should remain strong, given increasing competition among traditional broadcasters and emerging distribution partners, as well as stronger paths to monetization across digital platforms in either rights form or direct-subscription/ad-based models. RSNs Drive Media Rights Until National Deals Open Up in 2021; Digital Becomes Major Player: Key deals underlying the media-rights segment are locked in until 2021, when the next cycle of national-rights deals begins to overlap with the five-year projection period. The monetization of rights available in the nearer term as well as in at least the beginning of the next national-rights deal cycle should remain strong given increasing competition for rights among traditional broadcast intermediaries and emerging distribution partners. There are also stronger paths to monetization across digital platforms in either rights form or direct-subscription/ad-based models to the extent consumer engagement shifts from the linear broadcast. Media-Rights Deals Drive Value of Pro Franchises, Fuel Stadium-Build Boom: Media-rights deals have driven value growth across the major leagues for five years and counting, similar to the way adoption of league-wide revenue-share programs and construction of new stadiums, arenas, and ballparks enhanced local-team values over the two decades before, a 20-year building boom involving more than $55 billion in facility construction across professional sports and intercollegiate athletics, according to PwC research. Top-Tier Properties Likely To Remain on Linear Broadcast in the Near Term: According to PwC, broadcast-rights preservation is likely to remain an industry priority through at least the next deal cycle to prevent potential further dilution of rights fees. Any consumer-led disruption of the linear-broadcast market realized in the near term due to migration, either within pay TV or from broadcast to digital, is unlikely to materially impair the media-rights–fee landscape. This is particularly true for major properties with incumbent rightsholder carriage deals in place with major distributors through at least the early stages of the next deal cycle, as well as for subscriber migration away from or within the pay-TV bundle expected to occur over a protracted period. Lower-Tier Properties Could See Rights-Fee Declines: Lower-tier properties entering the deal cycle, however, could begin to realize, at minimum, lower growth multiples, if not fee-level declines, thus widening the rights-fee gap between premium and other broadcast content — particularly to the extent the pace at which consumers shift engagement to digital content increases and/or traditional intermediary partners shift to business models that place lower priority/valuation on live sports content. Shorter-Term Commitments by Rightsholders? : In general, next-cycle deals across the property spectrum could realize shorter-term commitments by rightsholders, particularly if existing rights-fee levels are preserved, with an increased share of market risk retained by properties, which would lead to increased volatility in future market size beyond the five-year Outlook period. Direct-to-Consumer Offerings on the Horizon: Existing digital products currently positioned as complementary to the linear broadcast are projected to preserve monetization of broadcast content related to cord-cutters and cord-nevers. As a result, direct-to-consumer offerings and other digital content are anticipated to be stabilizing forces rather than material drivers of market size through at least the next rights deal cycle as digital products build an incremental audience, product-feature roadmaps are realized, and subscription/ad models are refined. Immersive Experiences Will Be Key to Future Deals: Future growth within the media-rights segment beyond the next rights-deal cycle will hinge primarily on market engagement, with future generations of digital products that deliver premium, immersive experiences with either live or archived content enabled by a wide landscape of underlying technology, including personalized video, 3D video, augmented and virtual reality, and augmented video. With a potential global market size of more than $1 billion by 2025, immersive sports media will remain a nascent market relative to a number of areas, including gate, cable bills, merchandise, videogames, and direct-to-consumer offerings by properties and rightsholders. As a result, B2C and B2B spending on immersive technologies will impact existing value pools across the sports-market value chain, with the addressable market for digital video expanding as properties move further into digital-first and new fan experiences. The industry’s path to monetization for immersive-video products will vary by property, and those leagues/clubs that are unencumbered by exclusive rights terms are quicker to move from curated to viewer/fan-controlled content more likely to capture the upside from these new offerings. Gate Revenue Grows Slightly: Gate revenues — increasing at a 2.3% CAGR — will benefit from an uptick in the one-time effects of new-facility openings and league expansion during the Outlook period but will otherwise continue to moderate because of increased competition and price pressure, high-demand events drawing crowds at or near facility capacity, secondary (resale) market leakage, and the risk of potential exposure in economic downturn. Smaller Clubs Cashing in as National League Revenue Grows: Recent deal activity has also involved both smaller- and larger-market clubs within each league, which in tandem have elevated values and removed, to some extent, related ambiguity across the leagues’ member clubs due to transactions involving smaller-market clubs. As a result, growth in national revenue sources, generally shared equally, has narrowed the spread in values across a league’s member clubs. As Team Value Grows, Is Expansion on the Horizon? : With the new media-rights deals realized, it was expected that team sales after 2015 would likely transact, in at least the near term, at implied multiples back within the longer-run range, below roughly 5 times. However, the few teams (Mariners, Marlins, Rockets) that have sold after 2015 have transacted at price levels yielding revenue multiples above the long-run range as well — in part because of factors unique to their respective sales process or prospective local-revenue upside but also due to deal-friendly investor conditions and the pervasive seller’s market dynamic. The ever increasing deal size brings big questions to mind: what will it take for the leagues to once again consider expansion? Will it be in North America, Europe, or Asia? The industry’s ability to further monetize both its digital assets and international expansion will be key to driving further growth in the revenue base. Impact of Tax Reform: Proposed tax reform in the U.S. may affect the sports and entertainment industries. This includes elimination of preferred tax-exempt status for public bonds used to fund stadiums and related facilities, exclusion from preferential income-tax rates on business income associated with entertainment and sports, and restrictive limits on interest deductibility for debt supporting the underlying acquisitions. Final legislation may significantly impact the applicable U.S. income tax on operations and ownership of sports franchises. 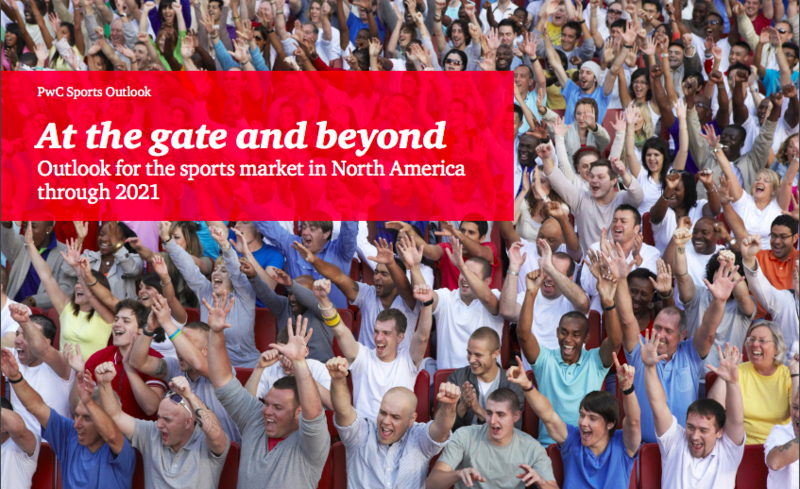 CLICK HERE to download PwC’s full “At the Gate and Beyond” sports-market outlook.